It is that time of the year, when you pack your bag for a wild yet a fun-filled trip to Belgium. This year it will be bigger as Tomorrowland is celebrating its 15 years! Theme: This year Tomorrowland is resurrecting the fan favorite 2012 theme, The Book of Wisdom The Return. Tomorrowland has become one of the most popular and notable electronic music festival in the world, held every year in July. In fact, the music festival has been bagging the International Dance Music Award for the Best Music Event since 2012, except 2017. In fact, it was nominated for the Festival of the Year in 2017 by Electronic Music Awards. Tomorrowland is the place that fills the soul of every music lover. It is a place that you must visit if you want to take a break from your routine life. Apart from getting to listen to your favorite artists, you would be meeting with people from different countries, making some new friends, and also enjoying the out-of-the-world art installations. Preparing for the best music festival in the world can get messy. From ticket purchasing to checking out, everything would require your due attention. So, before you make your way to the festival, here are some important things that you must know. 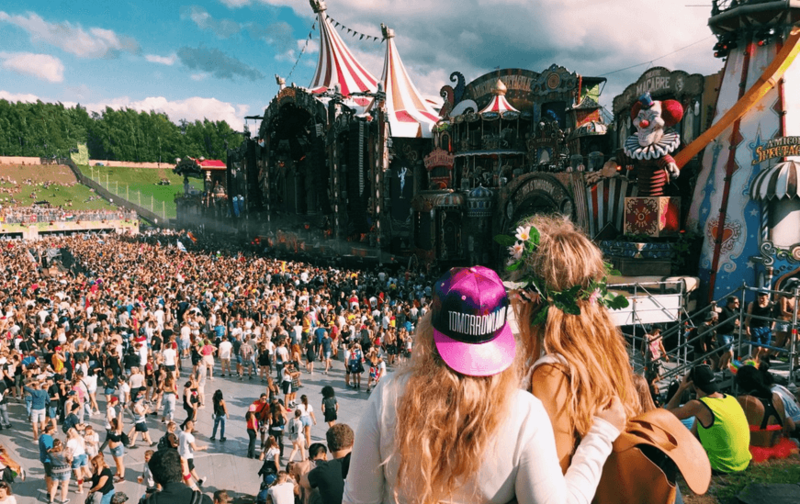 Tomorrowland isn’t your average International music festival. In 2013, around 180,000 attendees were recorded. The festival ended up selling 80,000 tickets in just 35 mins, and the rest were gone in a few seconds. Therefore, never wait until the last minute to get your ticket. It is advisable to order it online as soon as it is available. Luckily, the price of the ticket or the package depends on your accommodation preferences. A 1-day pass starts at around $110. In case you don’t get to buy a three day or more pass, don’t be disheartened. Just buy the 1-day pass and hope to find a local who might be interested in selling a Tomorrowland pass. Tickets are available through both, pre-registration and travel partners. Drugs! It is something that an average youth of today cannot bear to leave. You cannot take drugs to the mega festival unless you want to be kicked out in the middle of the fun-filled event. Keep in mind that the authorities at the festival don’t tolerate drugs at all. In fact, you will be asked politely to leave if you’re in possession of drugs. Face it; you can’t live without the internet regardless of wherever you are in the world. However, unless you prefer wasting your limited data package, the chances are that you would look for a public hotspot. Beware! Public WiFi are never secure. Whether you are connecting to a Wi-Fi network in a hotel, café or the festival, don’t join a public Wi-Fi. If you join an unsecured connection, you might lose your data to a hacker. Fortunately, there is a way you can connect to any Wi-Fi, i.e., through an encryption tool such as a VPN. A VPN will encrypt your device as well as your connection, protecting you from the harm of hackers or snoopers. When we go to crowded places such as Tomorrowland, it is natural that we would be concerned about our money. But you really don’t need to carry hefty cash in your pocket when you go to the festival. After all, Tomorrowland is a cashless event, and as such they have their currency for things that are sold there. When you order your ticket, you get a Tomorrowland box with it that contains not just the ticket but also the bracelet that acts as a debit card for you. You can top-up the bracelet with the desired amount and use the bracelet to buy foods and other goodies at the festival. You can get the unused money refunded to you after the festival. Apart from the thunderous music in the festival, you will also get to enjoy the laser light show. However, the prolonged exposure of the lasers to your eyes can be detrimental. Therefore, it is highly advisable to take sunglasses with you to keep your eyes protected from the blinding lasers. You would also need a good sunscreen for your skin to protect it from the scorching sunrays. The people at Tomorrowland are very possessive of their art installations. Besides, the fabulous art reflects their hard work and efforts that they put into it. A word of advice, don’t tamper with it or get thrown out. Since the weather in Boom is mostly sunny, a light outfit for the festival would do great. However, you should also take a poncho and used shoes with you that you can use if it rains. Tomorrowland is an international music festival, which is why you will see many people with flags there. People from different countries love to wear their flag as a cape to show off their nationality. Your flag may also lead you to fellow citizens that will be at the festival for the same purpose as you – enjoying music! Hundreds of thousands of people attend Tomorrowland every year. As you would expect, everyone wants to be near the main stage. While it’s tough to make it to the front row, it can get pretty sweaty once you get there. Truth be told, you’re better off afar than up close because in that way you will get to enjoy the creative work done on the mainstage. Apart from that, you can also visit the other stages at Tomorrowland that are just as entertaining. If you are going to Tomorrowland on its package, you will also get to enjoy the Detox Day. As the name suggests, the place is built for the post-festival day so that you can let you worn out body have some rest and “Detox” any residuals of the Tomorrowland festival. Now, you know the most important things you need to know before visiting the Tomorrowland Festival 2019. The electronic music festival was first organized in 2005 by ID&T, a leading event organizer. It is said that the organizer handed out free tickets for the festival to the locals. The purpose behind the free giveaway was to attract as many locals as possible. Naturally, the organizers were successful in doing so, but as a result of a free giveaway, they also incurred a huge loss. Ever since its first version, the festival has seen a significant increase in not just visitors but also the DJs or musical bands with popular names like David Guetta, Armin van Buuren, Blasterjaxx and more performing every year. Ever since 2009, Tomorrowland runs the festival around a theme. For instance, 2017 theme was Amicorum Spectaculum. Similarly, Tomorrowland 2018’s theme was The Story of Planaxis. So, what are you waiting for? It’s time to prep up!